It&apos;s not unusual to hear "lights! camera! action!" around Austin. More than 200 television and film productions have played out in our picturesque city over the last 40 years. Popular movies like Varsity Blues and Office Space were filmed in Austin. Browse the Austin Film Commission&apos;s complete list of movies and television shows filmed here. Alamo Drafthouse combines food, grown-up beverages and films at its multiple Austin locations. Catch all the latest releases, opt for a special screening, or take part in a movie sing- or quote-along. Who doesn&apos;t love to sling lines from the Big Lebowski? Craving an indie flick? 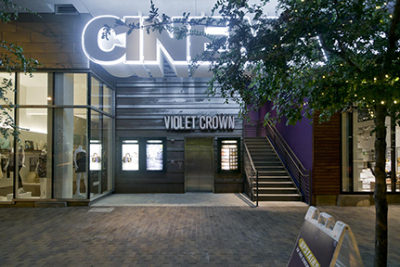 Catch a show on one of four screens at Violet Crown Cinema (pictured). Or go totally retro at the Blue Starlite Drive-in, the world&apos;s first and only mini urban drive-in, where indie films, cult classics and childhood favorites are king of the big screen. A mini version of traditional auto cinemas, Blue Starlite often features two films per night, with the option to add a vintage drive-in speaker and old-fashioned concessions to the package. For those who prefer luxe VIP over old school, iPic Theater has a seat for you. Linger over a glass of pinot and truffle fries or gourmet flatbreads before settling into your plush lounger (reservations required). Step out of the theater and pair your movie with moonlight and fresh air – some of Austin&apos;s top film spots are outside. Take in the stars and Shakespeare or family films and musicals at Zilker Hillside Theatre, an outdoor amphitheater hosting productions all summer long. The Sound and Cinema series brings together Austin&apos;s thriving music scene and hit films (think Top Gun) every other Wednesday throughout the summer. Sprawl out on the Long Center lawn, indulge in food truck goodies and watch bands pay tribute to the evening&apos;s film, followed by a screening on Alamo&apos;s giant outdoor screen. Watch family-friendly flicks like Ghostbusters on the grassy knoll or from an inner tube in the 70-degree water at Deep Eddy Pool with the Summer Splash Movie Series Saturdays at dusk. For the ultimate cinematic throw down, attend one of Austin&apos;s top-notch film festivals. In April, catch contemporary films from North, Central and South America, as well as the Caribbean and Spain at Cine Las Americas International Film Festival. If you&apos;re a television junkie, then ATX Television Festival is the event for you. A celebration of all things TV, the fest offers panels, screenings and parties galore where you can hang out with your favorite sitcom stars.